Now Available BasharTV*, DVD, CD and Instant Download! Bashar explores “the Triad Mind” and how aligning these three primary aspects of your consciousness can amplify your ability to follow your passion and create the reality of your dreams. • How many themes are there to experience? • Why do I have a phobia of spiders? • Does the CERN particle accelerator negatively effect the field of our planet? • Did the asteroid belt used to be the planet Maldek? • Is the incarnation history in our solar system related to astrology? • Help! I can’t find my excitement. • Being adopted makes me feel unworthy. How can I redefine this? • How can I connect with my past lives? • I’m working on a book. What advice do you have for me? • Why do I always attract unavailable or married men? 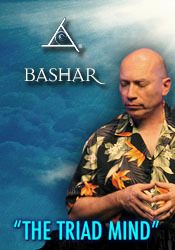 Bashar speaks on rejection. • I’m not very passionate about life right now. What can I do? • Why do I always feel like an outsider looking in? • What is your definition of synchronicity? • What is the correlation between synchronicity and the things that we are attracted to? • Why did the Grays seek human DNA as shown in the documentary? Did they regain emotions? • Could you comment on time and longevity? • I often dream of being in a space ship like the one in the documentary. Have I been abducted? • What kind of exercises can I do to help humanity besides meditation? • What is the best way to communicate with the cells in our body? • Why am I afraid of snakes? • How will I know when it is a good time to let someone go out of your life? • My mother recently transitioned. Does she have a message for me? • What is the symbology of The Cheshire Cat from Alice in Wonderland? • Why am I afraid of revealing my true self? • Could you give us a permission slip on how to integrate The Triad Mind in our life? • Could you expand on what you mean when you say you’re perfect? • Do you ever look at parallel versions of yourself? • What mistakes have you made lately? • Do you communicate with other parallel earths? • Sometimes when I am following my excitement I realize I am in that state, and then that realization takes me out of the state. Why dos this happen?